The tiny village of Arisaig, nestling on an inlet along the beautiful Morar peninsula, has a wonderful little museum. The Land, Sea and Islands Visitor Centre tells visitors all about the local flora and fauna in this relatively remote part of West Scotland. But it also includes a fascinating section on one of Britain’s clandestine organisations, the Special Operations Executive, or SOE. That is because, during the Second World War, Arisaig, and the area around it, was used as a training ground for SOE agents. SOE was unique in Britain, an official organisation established for the purposes of subversion and sabotage. 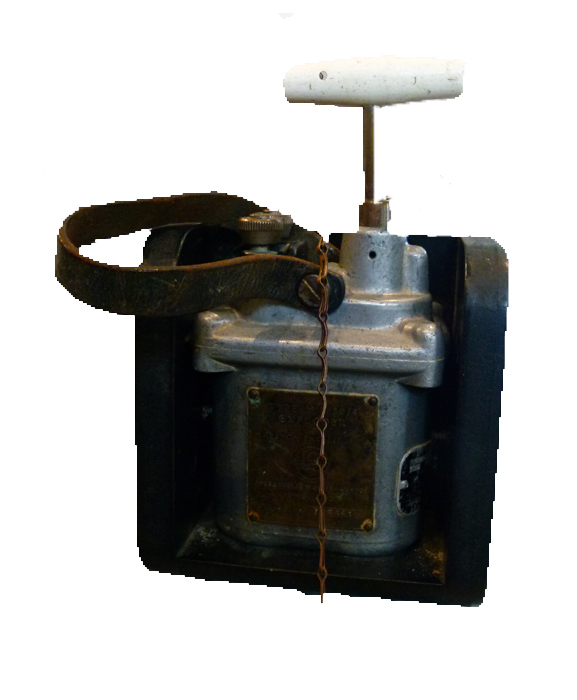 Few people knew of its existence, yet it came to operate all over Europe, including in neutral countries, Africa, the Middle East and Far East. At its peak, some 13,000 people were working in its offices and missions, and it requisitioned premises all over Britain for its various purposes. Here’s a bit about some of them, and a little of SOE’s remarkable story. Let’s start at the very beginning. By the end of June 1940, Czechoslovakia, Norway, Denmark, Belgium, the Netherlands, Luxembourg, France and half of Poland were all under German rule. The other half of Poland was occupied by the Soviet Union, which had signed a non-aggression pact with Hitler. Italy had declared war on Britain (and France) earlier in the month. Britain, albeit supported by the Commonwealth, stood alone in a Europe dominated by the Nazis. 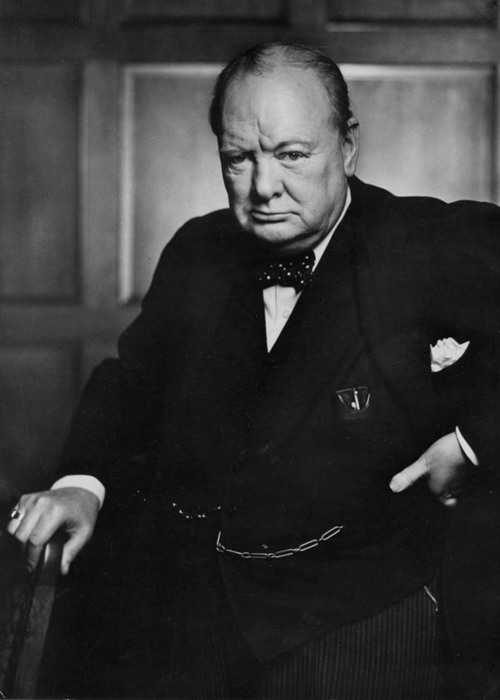 The new prime minister, Winston Churchill, was determined that Britain should challenge Germany by whatever means possible. He knew it was vital to convince the British people and the wider world, particularly the United States of America, that Britain was able to keep fighting. Military options after the defeat and retreat from France were limited, but he believed that guerrilla warfare was one serious option; it would oblige the Germans to divert resources to deal with it and, moreover, help keep the spirit of resistance alive in occupied countries – another essential objective, in Churchill’s view. Not everybody shared Churchill’s enthusiasm, or point of view. Many in the military opposed SOE and its activities on the grounds that the organisation was of limited military value (which was true, in conventional terms) and that it diverted attention from the main requirement to defeat the Axis Powers on the ground (which missed the point). The Head of the SIS, Sir Stewart Menzies, consistently opposed SOE, believing it to be amateur, dangerous and a risk to the serious business of intelligence-gathering. Interestingly, unlike the SIS, SOE trained its operatives. SOE continually evolved throughout the war. 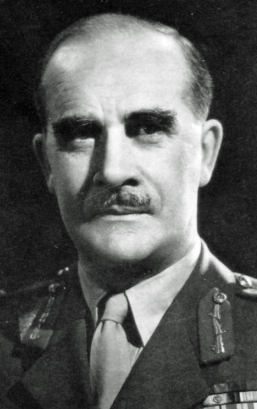 Its first chief executive was Sir Frank Nelson, a former businessman, MP and intelligence officer in the previous war; Sir Charles Hambro, chairman of Hambros Bank, took over from May 1942 to September 1943, when he was replaced by Major-General Colin Gubbins, a Highland soldier with a distinguished military record who had been in charge of SOE’s training and operations. Gubbins was a most effective leader; prior to joining SOE, he had been organising the behind the lines resistance that would be mounted in Britain in the event of a German invasion – a responsibility maintained by SOE for awhile after its creation. So, SOE was to create mayhem – initially in Europe, though its geographical reach expanded along with the war. It was not long, for example, before the conflict spread to East and North Africa; and war with Japan was probably inevitable. In Europe, Greece and Yugoslavia would fall to Hitler’s armies in 1941 and become important theatres of operation for SOE, which had to coordinate, inspire and support resistance activity against the enemy. It also had to liaise with the representatives of various governments in exile. At an operational level, its people had to master the arts of disguise, deception, bribery, blackmail, black propaganda, forgery, burglary, sabotage, guerrilla warfare – and murder. SOE was also responsible for running escape and evasion lines for captured servicemen and women, and others. And to achieve this it needed to recruit and train appropriate personnel. It also needed premises. Senior staff in SOE often had a public school and Oxbridge background, but were an eclectic bunch. One its chief recruiters, for example, was a thriller writer, Selwyn Jepson. The head of the French section, Maurice Buckmaster, had been a manager with the French branch of the Ford Motor Company before joining the army at the outbreak of war. Buckmaster’s assistant in the French section, the intrepid and capable Vera Atkins, was born in Romania to Jewish German-British parents, spent part of her privileged childhood in what is now the Ukraine and studied in Paris and Switzerland before emigrating to Britain in 1937. SOE’s agents had hugely various backgrounds. Some were escaped nationals of occupied countries; others had particular skills – especially languages. John Goldsmith trained race horses before the war; he was recruited by his sister-in-law’s divorce lawyer, who happened to be working for SOE. Hardy Amies was a fashion designer – who much later became the Queen’s dressmaker. 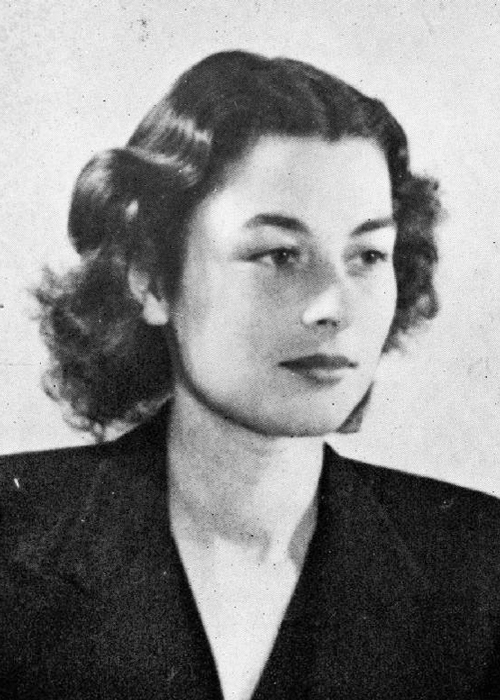 Violette Szabo (née Bushell) worked at the perfume counter in the Bon Marche store in Brixton at the outbreak of war, but had a French mother and was bilingual. Christine Granville was a Polish countess. Virginia Hall was an American who had a prosthetic left leg called Cuthbert. Hall later transferred to the American Office of Strategic Services (OSS), inspired by SOE, formed in 1942 and the forerunner of the Central Intelligence Agency (CIA). Many recruits had no military training or experience. For administration purposes, civilian recruits were given military commissions, many into the Intelligence Corps. Female agents were commissioned either into the Women’s Auxiliary Air Force (WAAF) or, often, into the First Aid Nursing Yeomanry (FANY) – popularly known as the ‘Fannys’. By mid-1944, over half of the FANY’s strength was devoted to SOE. There is a FANY memorial at St Paul’s church, Knightsbridge, London. The Special Operations Executive eventually used an astonishing number and variety of premises throughout the country for its different purposes. After starting off in temporary offices, it moved its London headquarters to 64 Baker Street on 31 October 1940 and by 1945 occupied about 6 acres of office space in the area. “Baker Street” became a euphemism for SOE – which was also nicknamed “the Baker Street irregulars” (among other things – “the Ministry of Ungentlemanly Warfare” was another favourite). In 2010, a plaque was unveiled on 64 Baker Street, noting the association. 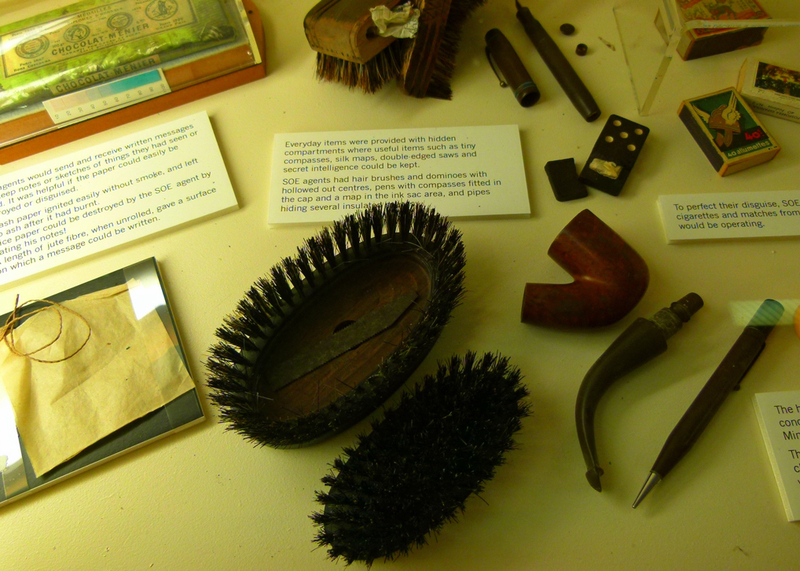 Weapons, explosive devices, radios, booby traps and so-on were developed at premises in Buckinghamshire and Hertfordshire; elsewhere, forged identity papers, letters etc were produced; a former roadhouse, the Thatched Barn near Borehamwood, was requisitioned for the camouflage section which, amongst other things, produced authentic clothing and personal effects. It is hard to see how Britain could have conducted the war without its numerous country houses. Certainly, the Special Operations Executive made good use of them; some wag quipped that SOE was in fact an abbreviation for “Stately ‘omes of England”. Basic agent training started with a two or three week military induction course at one of these, the Elizabethan Wanborough Manor near Guildford, in Surrey (now a private residence) being referred to in many accounts. Another was Winterfold House, near Cranleigh. The day began with a cross country run. After breakfast there would be some elementary map reading, or perhaps practice with pistols and submachine guns. There would be time on assault courses and various endurance tests. In the evening, the instructors would see how much alcohol their students could consume without falling over, and how they behaved whilst under the influence. Allegedly, there were also tests of loyalty using potential sexual partners. Sometimes, when enough booze had been consumed, the instructors would throw in a nice little night exercise for good measure. 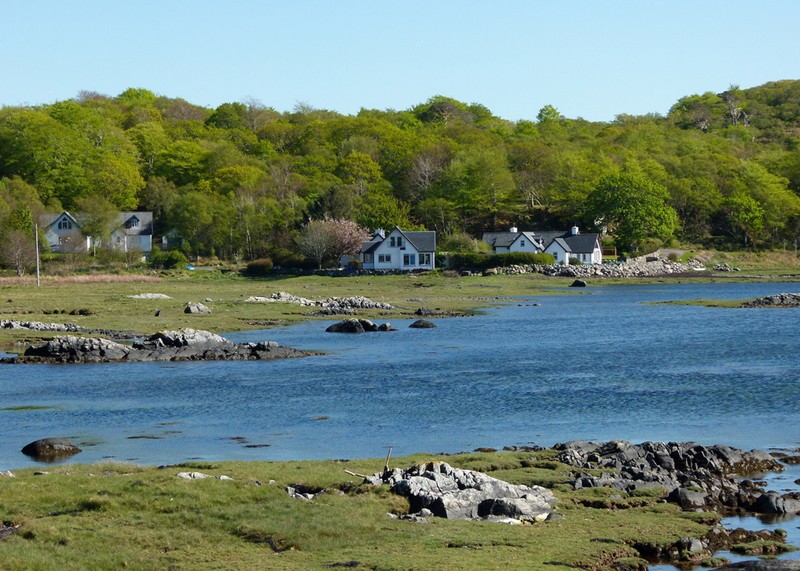 If prospective agents got through basic training, they would be sent to Arisaig. This was where the recruits underwent intense training in field craft, including living off the land, sabotage and demolition. One of the small arms instructors was Gavin Maxwell, the naturalist, who went on to write Ring of Bright Water. Apparently, Maxwell invented “the double tap” – the standard two shots of a professional assassination. Lessons in unarmed combat and silent killing were overseen by former members of the Shanghai Police, William Fairburn and Bill Sykes, dubbed the ‘Heavenly Twins’. They allegedly concluded all sessions with the instruction, “and then kick him in the balls.” Fairburn and Sykes designed the Fairburn-Sykes fighting knife – a dagger – manufactured by Wilkinson Sword and issued to British commandos and special forces all over the world. SOE requisitioned a number of houses in the area. Initially, Inverailort Castle was used, before being taken over by the commandos and, later, the Royal Navy. SOE headquarters was based at Arisaig House, now a country hotel. Among those who stayed at Traigh House, which is now a luxury holiday let, was the Czech Jan Kubiš and the Slovak Jozef Gabčík, two of several Czechoslovakian soldiers in exile training with SOE in the area. Kubiš and Gabčík went on to carry out Operation Anthropoid, the assassination of SS Obergruppenführer Reinhard Heydrich in Prague on 27th May 1942. They died, or committed suicide, in a subsequent shoot-out, when German troops surrounded a church they were hiding in. 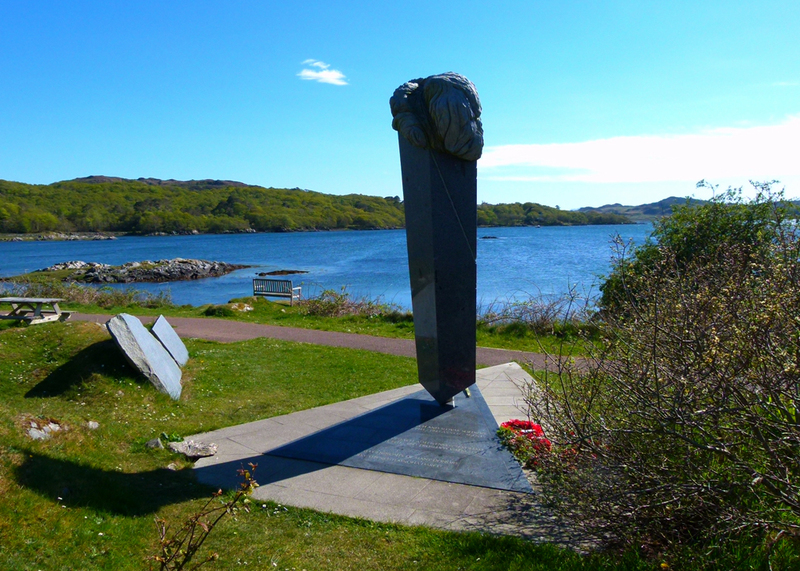 There is a memorial in Arisaig, to the Czech and Slovak soldiers who trained as SOE agents nearby. It was unveiled on 11th November 2009 and depicts a fallen parachute. It was made near Prague. The authorities effectively sealed off the entire area around Arisaig for the duration. Though there was some local resentment, many were staunchly Catholic and Gaelic-speaking and recalled with pride that they had not betrayed Bonnie Prince Charlie as he hid nearby with a £30,000 reward on his head in 1746. Anyway, two hundred years later, the enemy never found out about the existence of the special training schools. Some of the locals were enlisted to help with the training – poaching and boating skills, for example, were on the curriculum (though some agents found a small charge of plastic explosive a useful method of salmon fishing). The agents that survived Arisaig would be sent to finishing school at Beaulieu in Hampshire’s New Forest. There were other specialist schools, too; for example Thame Park in Oxfordshire which was used for SOE signals training. At Beaulieu, on the estate of Lord Montagu, were a dozen country houses where agents learned about personal security, maintaining their covers, communication – and what to expect if caught. There was a great deal of role-play in conditions that were as realistic as possible. Men dressed in Gestapo uniform would wake students in middle of the night and, without warning, would drag the agents off to face interrogation. Being a good actor was a prerequisite for survival when confronted by enemy security services – and when simply living inconspicuously with a false identity in an occupied country. It was also at Beaulieu that agents were instructed to carry out bogus missions in Britain, such as gathering information from restricted areas (like docks), surveillance, planting a fake bomb in a factory, or setting up dead letter drops – without getting caught. Accounts of these realistic exercises make interesting reading. 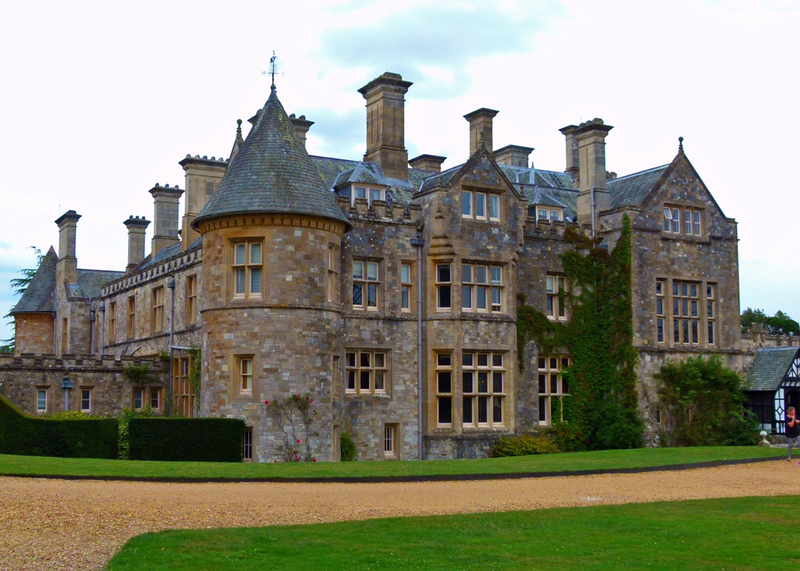 Today, Beaulieu Abbey Estate is the home of the National Motor Museum – and more besides. There is a plaque on the cloister wall that commemorates more than 3,000 men and women of at least seventeen nationalities, European, Canadian and American, who trained there as agents. There is also a fascinating little museum in the gardens, the Secret Army Exhibition, which tells the story of SOE’s association with Beaulieu and some of the work agents carried out. Agents were physically infiltrated into hostile territory by a number of means, including boat, submarine, aeroplane – and by parachute. Parachute training took place at Ringway, which is now Manchester Airport. 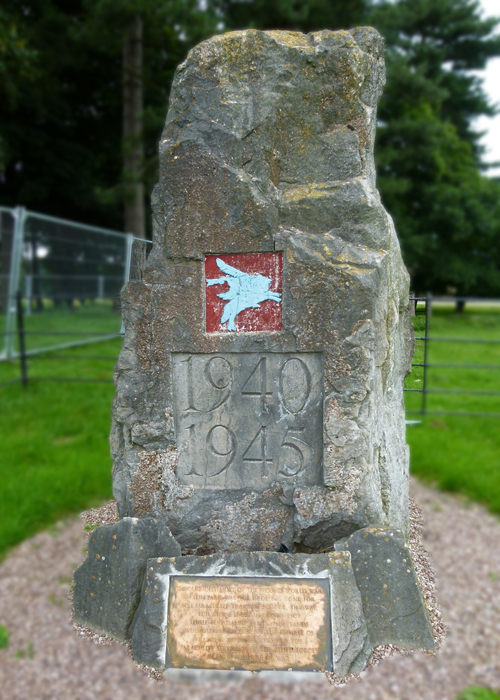 In the Second World War, it was the home of No 1 Parachute Training School and a favourite DZ (drop zone) was in the grounds of Tatton Park, in Cheshire. A memorial marks the spot today. 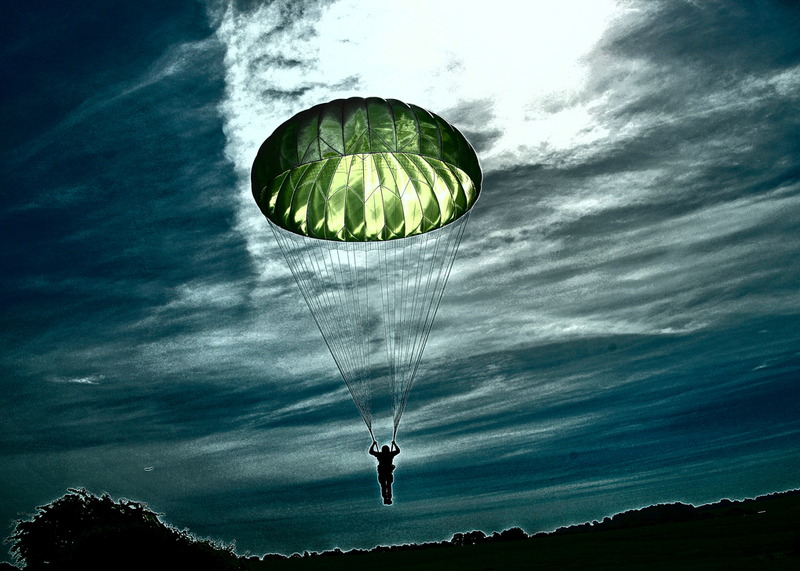 SOE agents were accommodated at nearby Dunham Massey during their parachute training. 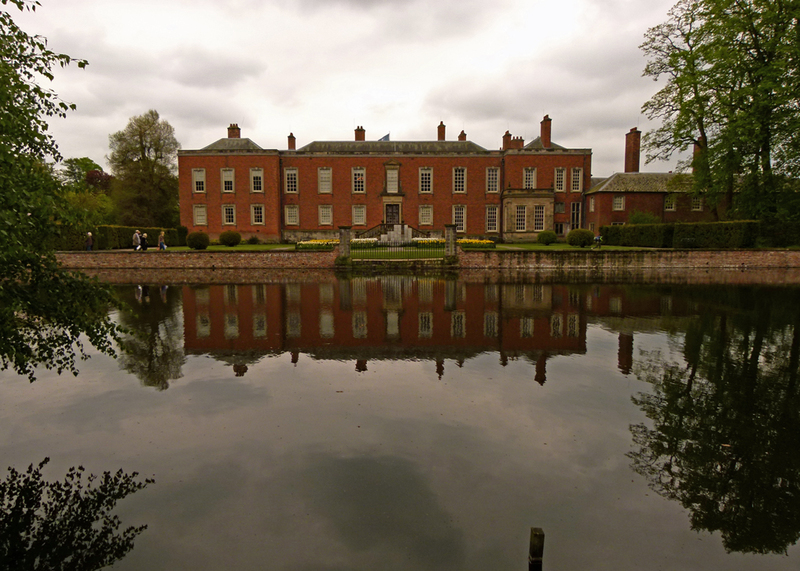 Both Tatton Park and Dunham Massey are open to the public. Sometimes, it was more appropriate to land agents in the field – or to collect them personally. The problem with this was finding a suitable place to use as an airstrip. 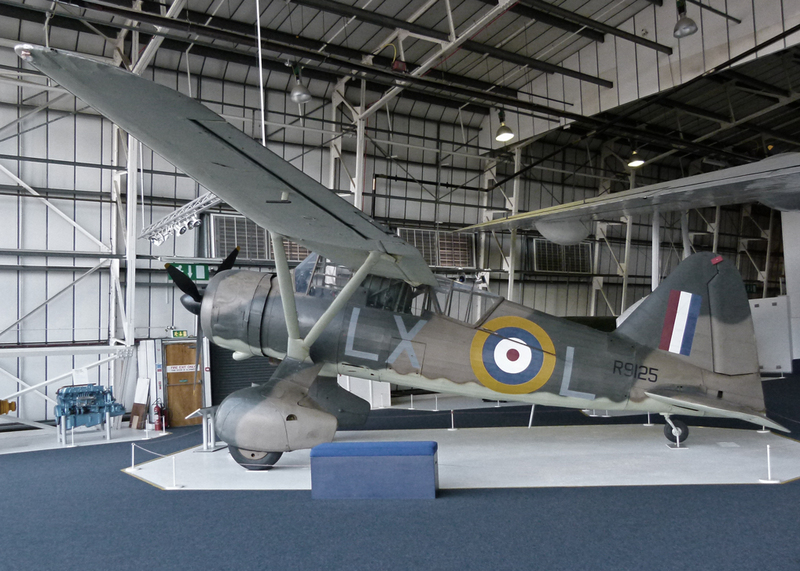 The Westland Lysander had a particularly short take-off and landing and proved to be ideal. Special squadrons, 138 and 161, based at a secret airfield, RAF Tempsford in Bedfordshire, flew their all-black painted ‘Lizzies’ for SOE from there. They would refuel on the way at RAF Tangmere on the south coast, famous as a Battle of Britain airfield. There is an aviation museum at Tangmere and a memorial outside Tempsford church to SOE’s agents and the RAF pilots who ferried them. Almost everything about the world we live in now is wholly different to the world of the 1940s, particularly if you lived in a country that was fighting for its existence, or occupied. It is hard to comprehend what the men and women of SOE went through once they arrived at their destination to start their mission. For a start, how do you go about identifying people who want to resist an oppressor, let alone subsequently establish networks, organise armaments, training and plan acts of sabotage? The prospect of living and working under Nazi or Japanese occupation during the Second World War strikes me as a cold, dark and infinitely terrifying one. In the early days of the war, until Allied victory seemed likely, most people were simply too frightened, for themselves and their families, to seriously contemplate resistance. The handful that did were extraordinarily brave. Moreover, many local people in occupied countries were more interested in their own factional struggles – often employing weapons supplied by SOE accordingly – than in accepting orders from London about how to serve the Allied cause. Agents needed political nous as much as technical knowledge and leadership qualities. Resistance groups were not always the well-organised bunch of determined big-hearted patriots portrayed in movies; though no doubt sometimes they were. Nor was SOE itself perfect. It made mistakes that cost lives, particularly in the early days. Some of its officers also had ideas that belonged in the realms of fantasy. Plus, of course, it was up against resourceful enemies. 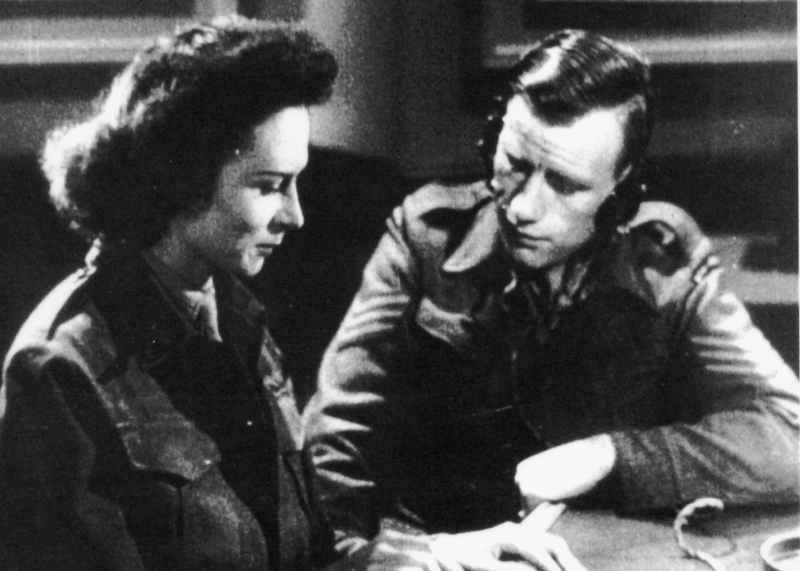 In Holland, the local Abwehr (German military intelligence) managed to control a captured SOE radio operator, exploiting the situation to their own benefit – an operation the Germans nicknamed Englandspiel (the England game), eventually controlling 14 different British wireless sets. 51 men from SOE, 9 from SIS and 1 woman from MI9 (a branch of military intelligence) were eventually captured, of whom most were shot. There is, however, a theory that SOE knew their agents would be captured and that this was a double-bluff sting; we will probably never know the truth. When I began researching this article, I was astonished by how much information is available about SOE, both in hard copy and on the Internet. I was surprised to discover how much I already had myself. I suppose it’s a topic that intrigues – stories of brave men and women, combined with the clandestine nature of their work. Let’s face it, most people love James Bond. But of course the real world of secret agents is not at all glamorous; it is invariably lonely and usually extremely dangerous. We know the real-life stories of some of these people – some of them are mentioned above – others include Odette, Noor Inayat Khan, Peter Churchill and FFE Yeo-Thomas, codenamed, “The White Rabbit”. Of all of them, the story of Violette Szabo resonates most with me. She was the subject of a book by RJ Minney, then a 1958 film, Carve Her Name With Pride starring Virginia McKenna. Her beautiful face stares at us from the past. She was captured in a gun-fight, attempting to delay the SS Panzer division Das Reich on its way to the Normandy front in June 1944. Interrogated, she was eventually sent in chains to Ravensbrűck concentration camp, where she was, probably, either shot in the back of the head or hanged in January 1945, aged 23. The Special Operations Executive was officially dissolved on 15th January 1946. Some of its functions and personnel were transferred to other departments. According to the National Archives, many of its records were destroyed in a fire at its Baker Street headquarters in 1945. A memorial to SOE’s agents was unveiled on the Albert Embankment by Lambeth Palace in London in October 2009. It particularly commemorates Violette Szabo, the Heroes of Telemark and the Maquis (French Resistance). There is a Violette Szabo Museum in Herefordshire and a section in the Military Intelligence Museum at Chicksands devoted to SOE. There are many and various histories available. If you’re interested in individual stories, I can recommend The Women Who Lived For Danger by Marcus Binney (2002), which gives fascinating accounts of ten of SOE’s extraordinary female recruits, and Accidental Agent by John Goldsmith (1971), which tells of his own, often bizarre, experiences as an agent. I have been meaning to write this piece for sometime and was finally inspired to by a visit to Arisaig’s Land, Sea and Islands Visitor Centre. I wouldn’t have known it was there if our good friends, Pat and Amanda, hadn’t taken us. My brief account barely scratches the surface of the secret world of a short-lived organisation. We will never know all the facts of Britain’s Special Operations Executive, or the whole truth of the individual stories. Given the breadth of information out there, you may wonder how much of it is, whether intentionally or not, fabrication. But at least we can visit some of the places associated with this most incredible part of our history. There are some I’d like to seek out; I suppose many are forgotten already. I think I’d like to go back to Arisaig one bright summer’s day, think about the young people who passed through there, what motivated them, how they fared, what happened to them; and say thank you. Then maybe we can take a boat trip together to the nearby islands of Eigg, Muck and Rum. We in this country were more than blessed to have such dedicated people,men and women who laid down their lives so willingly. NEVER cease to be amazed at such courage. You’re absolutely right – couldn’t agree more. And not just UK subjects. Quite rightly the entry requirements, physical fitness standards and round the clock personal assessments were set so high, that many candidates failed the courses at various stages of the process.. Because the Special Operations Executive was so secretive in nature and subject to the Official Secrets Act, and the fact that it was wartime, failed candidates could not just be released and allowed to return home, and were subject to a period of internment in various houses in the middle of nowhere in Scotland. This could explain why some of those accepted into SOE remained in the UK for the duration of the war. Also they may have been instructors in various aspects and would have been to valuable to be sent out on operations. Those who have an interest in SOE might also be interested in the GHQ Auxiliary Units, set up by Winston Churchill and commanded by no other than Colonel Colin McVean Gubbins who later controlled the SOE. The Auxiliary Units were Britain’s own resistance army, and the training in some respects was very similar. I’ve often wondered what happened to the ones that were ‘rtu’ as it were. Colin Gubbins was a fascinating chap! Wow – you must be so proud. Make sure you finish that book! And thanks for popping in and leaving a comment. Thank you for this , my father was a member of the SOE but his records say he never left England, but he suffered from malaria, yellow fever and had a very unusual rash on his back. He in later life used to have nightmares about his experiences. That’s VERY interesting…I hope you track down his story. Thanks for dropping in to A Bit about Britain and leaving a comment. Thanks again for sharing this link, and for the book recommendations! (Our library has neither- and I suspect the cover that popped up for ‘The Women Who Lived for Danger’ was NOT a history book, ha! I’ll have to hunt elsewhere…) This was a fascinating read and remembrance to the men and women who served and sacrificed. What a fascinating post, and such a great range of pictures used to. Mike, I have to applaud you for your excellent research and thoughtful and articulate explanation of SOE and its history and heroes. I’m somewhat familiar with it through reading numerous books about WWII but only in general terms. I’ve seen a few documentaries about it as well, and some of the names, Vera Atkins, Violette, etc., are familiar. But hearing their stories through your thoughtful words, excellent photos and well written post really brings it all to life. I know things like this take a lot of work — but you aced it. And you also made me want to see these places in person. So, thanks for that and thanks also for your visits and wonderful comments on Marmelade Gypsy. You made me feel very good indeed! Somehow I lost your blog, but I have it back now and I am glad because this was a fascinating post to come back to! It sounds as though you put it down somewhere; Mrs Britain does that with her glasses. Thank YOU, what a great post. I recently saw a new movie trailer Anthropoid (2016) about the the assassination of Heydrich … do you know how well the movie does with the story? Thank you again for sharing your research. My boys are WW2 history buffs. They will enjoy this post as well. I am off to share it with them. Thanks, Carla. I don’t know that movie – will keep an eye open for it. Heydrich was an extremely nasty piece of work. A comprehensive and interesting post Mike. Must have taken a good few hours to write and put together unless you are a gifted ten fingered speed typist as I know how long my own posts take as soon as I add facts and research to the mix using two…sometimes even three!! !… digits. Nice to see an old Nobel stick of explosive. Thanks, Bob. ALL of my posts take hours – I’m a slow writer anyway, let alone the time that research takes. I’m a gifted one-finger typist… It sounds like you and explosives have some history! Fabulous post, Mike! Some of it I knew but quite a lot was new to me. Such brave, noble young men and women. Thank-you. What an interesting piece about a little known bit of war history. I’m working my way through William Manchester’s 3 volume biography of Winston Churchill and I’m reading the parts about WWII. right not. I don’t know William Manchester’s work – have read several biographies of Churchill, though; I wonder how many there are?! I would not have known very much about the SOE, until reading the books about Nancy Wake and the Marquis. I can see that the SOE records were destroyed by fire at the organisation’s headquarters straight after the war ended. But do you think the fire was deliberate, to protect the participants from revenge? I’ve heard of Nancy Wake ‘The White Mouse’? – don’t know her story, though I do know she survived. I don’t know whether the fire was deliberate; will we ever know…?! Nancy Wake was a spy who worked in the SOE (F section). She survived the war. I have spent 6 months studying her and I have never heard of the fire to have been related to her. But that part of history is hard to figure out. Mot of them were spies, so we will never know if it was deliberate. please reply if you have more info on this. I hadn’t heard that the fire was related to Nancy Wake at all. Sorry, I don’t have any more information on this – and sorry for the delay in responding to your comment! “We Die Alone” by David Howarth. I couldn’t help but think of it when I read your post when you said how different it would have been to be in a country that was either occupied or in in danger of being so. Mike, look up the book “We Die Alone”, if you get the chance. I wrote about it on my blog and got a nice comment from Norway. It was made into a movie there and retitled “Nine Lives” and most Norwegians rate it as their favorite movie of all time. Looked it up, Kay – not a book I know; it looks absolutely fascinating. I can’t imagine what it would be like, to live through things like that. What a wonderful post, I thank you very much for it! You are very much correct when you say that people now really don’t know what it would have been like to have either lived in an occupied country or in one that was in danger of invasion. So many people that you have given me to look into! Fascinating! That is a really interesting post, and rich in historical elements. That SOE must have been something back then. Thanks for sharing the in-depth thoughts. Greetings! They did exceptional and extraordinary things in that war. I’ve read some accounts myself. The Ministry of Ungentlemanly Warfare is fitting!